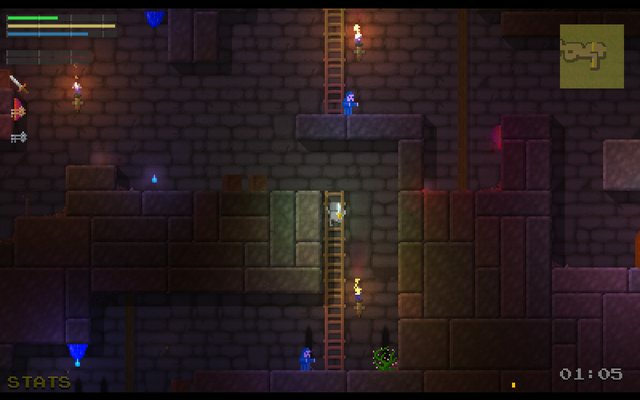 The Dungeoning is a mix of things, it's a difficult action game and a platformer with a bit of RPG and Rogue mixed in. 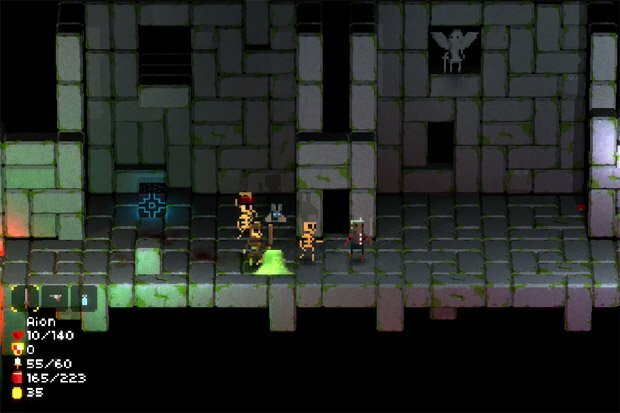 It's inspired by Dark Souls and 16 bit platform games. If you die in The Dungeoning, you die in real life. No, wait, if you die you lose everything and start again in a new world. You can level up your players various stats to improve strength, stamina, defence and magic. Killing enemies increases the players experience, which can be spent however you like. There are many varieties of weapons to collect and master through the game - Swords, Bows, Catapults, and magic weapons. Also there are shields. You'll need to gather resources as you play if you have any chance of surviving. These range from things that heal and replenish magic power, to berries with specific healing effects, for instance a water berry would be a great thing to eat if you were on fire. IT WOULD BE COOL IF THERE WAS JEWELLERY OR SOMETHING. There is! There are many rings to find that will help you survive. Some light your way, some protect you from fire, some make you sneaky. There's a lot of them but you can only wear two at a time. I know, but it has some elements commonly associated with Roguelike games, such as procedural level generation, magic, weapons, stats, high difficulty and permadeath. Roguelike is a convenient term for these things! @nickd3000 - This is my first attempt at making a game solo, and the first game I've programmed myself. I'm doing the design, art, code and music. Wish me luck. I have made other games in partnership with @physmotone (Mos Speedrun, Lineable, and Ghostracer - all iPhone, in which I did the design and art). I'm getting close to finishing this but I don't know exactly when. Feedback makes the world go round and the games better! If you have any thought on what you've seen or played, please let me know, either here or contacting me on twitter (@nickd3000) or the web site above. For graphics I'm Using Photoshop and Graphics Gale for animation. For sound editing I'm using Audacity. For all the feedback, kind words and criticism so far, it really means a lot! Anything that features permadeath has my attention. Nice work! Do you plan to add any flavor of cooperative play to the game? Ooh. Action roguelike. With cross-platform support! looks nice otherwise. What magic will be there? I like the look of the game, but on second thought, could you maybe remake the lighting a little bit? The contrast between neighboring blocks is a little too harsh. The retro theme is very appealing. Do you think you'll have music in the final version? Yes definitely planning to have music. I'll have a try at making it myself first and when that fails I'll look for some! Mostly projectile based, I have an auto targetting system in there at the moment, I'll try to come up with some interesting elemental magic that will apply status effects. I thought I'd post a pic of a recent thing I added to the game - some shadows drawn on the solid level tiles, it makes the walls stand out a bit better I think. This looks great and the title is awesome. I'm already thinking there should be a sequel called 'The Undungeoning' in which you have to fight your way back up to the surface. Haha that means I can pretend I'm saving all the good stuff for the sequel! I really like this concept. The movie looks great, the animations and pixelart are super sweet - I know I'm going to love it if you keep going like this. But there is one thing I cannot look past - you've been obviously inspired by Legend of Dungeon (which is perfectly fine), and using the same look on those big, beveled stones just does not work for me. I'd personally try to find something, a slight variation in shape, material or anything that makes this element of your game look a bit different. The look of those stones is so iconic, and they are so dominant in the screenshots, and I fear that if you don't differ more than you are currently, you'll have a hard time finding your own visual identity. Just a little update. I've uploaded a new work in progress video, with a few minutes of game play over a couple of procedurally generated levels. I've recently been working on player stats, wearable rings that give player ability buffs, destructible objects, menu functionality and a few other things. 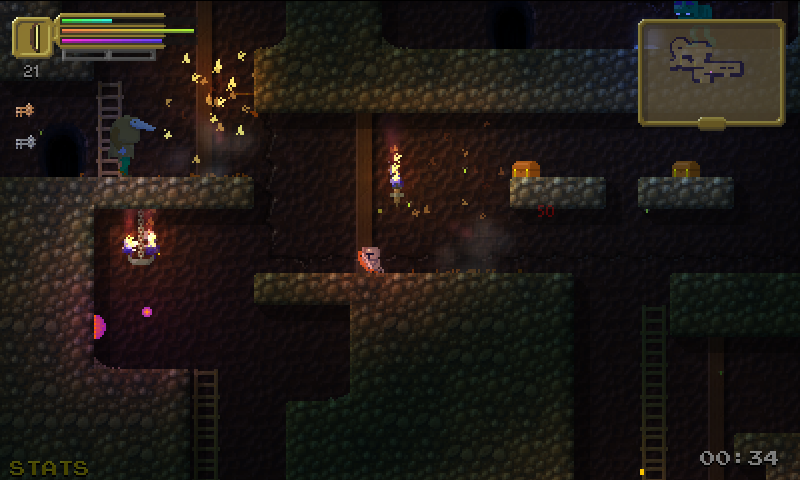 It's still work in progress so there will be a lot of refinement to level generation, graphics and sound. (sorry there's no music yet). Also, the wand I collect about half way through is way too powerful at the moment and makes it look a bit easy. Does this game have classes or leveling? Or are you just using "roguelike" to denote "procedurally generated levels and permadeath"? There will be levelling up, class will be denoted by the stats allotted to the player at the start of a run. Individual stats can be increased and various items provide status effects, boosts and buffs. Point of order, but - while it's been a long time - I don't recall the original Rogue having classes either? Not so sure about levels... the main difference I notice between this and my conception of a 'roguelike' is that this is real-time combat rather than the step-by-step stuff you get in most roguelikes. But then, the definition seems to be changing anyway.